There were 360 haiku entered from 8 countries. The organisers would like to thank all those who entered for supporting the pathway project and Katikati-based King’s Seeds for sponsoring the cash prizes. A classic seasonal scene which offers two readings thanks to its pivot line – the autumn moon is eclipsed for a moment by migrating geese; the migrating geese are eclipsed for a moment by the autumn moon. Purists will know that in Japanese haiku tradition ‘autumn’ doesn’t need to be attached to ‘moon’ as ‘moon’ is recognised as signifier of that rich season – and an autumn moon is always a full moon or harvest moon unless otherwise specified. So this haiku has two season-setters – autumn moon and migrating geese – but I don’t find that to be burdensome as the poem is full of sound and movement (geese), calm (moonlight) and subtly asks us to ponder the mystery of the birds’ powerful urge to migrate at a certain time and uncanny ability to do so over long distances. The beauty of the moment is intact and shines as brightly as that moon! From classic to modern – a good demonstration of how haiku can be used for any topic, including Europe’s refugee turmoil. Has the word ‘café’ been chosen deliberately to place this poem in France, possibly even Calais where a notorious refugee camp was recently demolished? There’s a good deal of mystery in this poem: Why is the refugee kissing the café window? Has s/he just got a job there, heard some good news, is doing something to reflect his/her good fortune at being accepted for settlement? Is the refugee awaiting settlement or has s/he been received into a new home country? Is s/he inside the café or outside? Whatever the answers each reader brings to this haiku – and its zany echo of Pope John Paul II kissing the ground whenever he arrived in a new country – I think we can safely say the future is looking good. The author has carefully chosen the words used – the hard ‘k’ sounds balanced by the soft sounds. Although the lines between haiku and its cousin senryu are now often blurred or ignored, this poem is more properly a senryu as it’s concerned with the doings of humans rather than nature. Another clue is that there’s no immediately definable season, although online sajiki (list of season words) place ‘clear sky’ as autumn or winter. However, my gut instinct is that this is a spring scene, with ‘clear sky’ and ‘kisses’ combining to produce, for me anyway, an optimistic reading. The surface dichotomy of this haiku puzzled and intrigued me at first – why would the poet’s thoughts in an autumn garden be green? Then the penny began to drop – it might be a reference to environmentally friendly practices. For instance, collecting all those beautiful leaves to make a rich mulch or just raking them over a bed that’s put to sleep for the winter, or using pruned branches as stakes or to make a ‘bug hotel’, keeping beneficial insects snug for winter. Perhaps the poet is assessing a garden that’s fading and planning fresh plantings for the spring and summer to come. ‘my thoughts /a deeper green’ are very satisfying lines to read and say. Judge’s report by Sandra Simpson. Carlos Colón (Haiku Elvis) died suddenly on October 30, aged 63. I met Carlos at Haiku North America in 2013 although we already knew one another by email a little bit. He shared a lunch table with me one day – I was so taken with his beautiful Louisiana accent and his sense of humour. 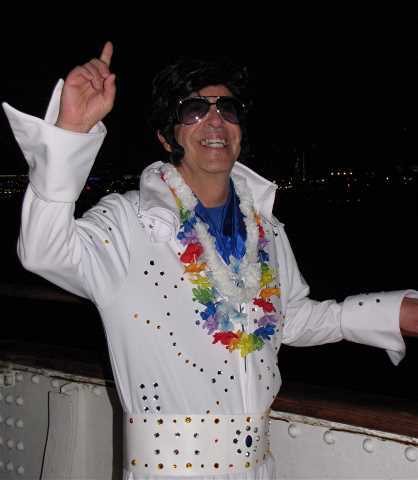 He was a real gentleman – even when dressed as Haiku Elvis! He did a short talk at the festival about his path to becoming Haiku Elvis, needless to say it was hilarious. Carlos authored at least 12 poetry chapbooks and had more than 900 poems printed in a variety of magazines including Modern Haiku and Frogpond. He was one of the poets featured in Tazuo Yamaguchi’s Haiku: Art of the Short Poem, a DVD documentary and has three haiku in Haiku in English: The First 100 Years (W.W. Norton, May 2013). 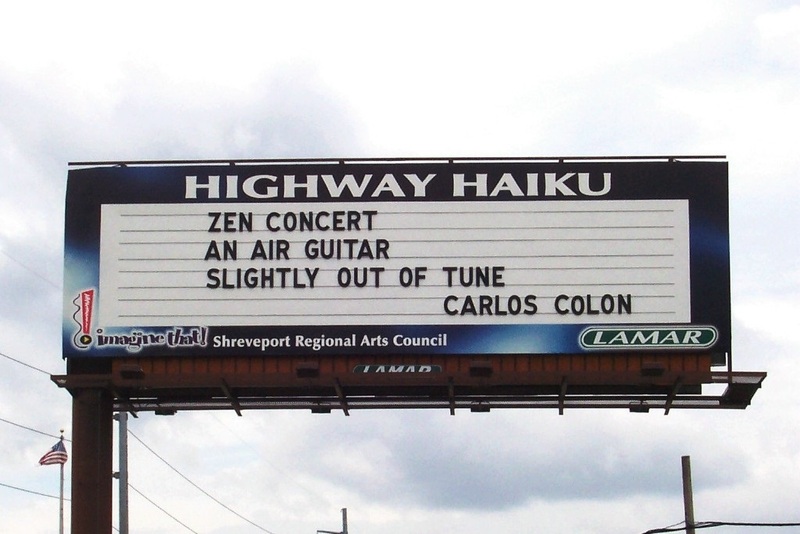 Here’s a 2009 selection of his senryu, plus a great photo of Carlos. So here I am using it – Carlos, in his own words. Having misinterpreted the assignment (sigh), I am offering my Top Ten favourite poems of the ones I have written. The best of my early poems, this one was reprinted more than 20 times including in The Red Moon Anthology (1997) and Haiku World: An International Poetry Almanac. 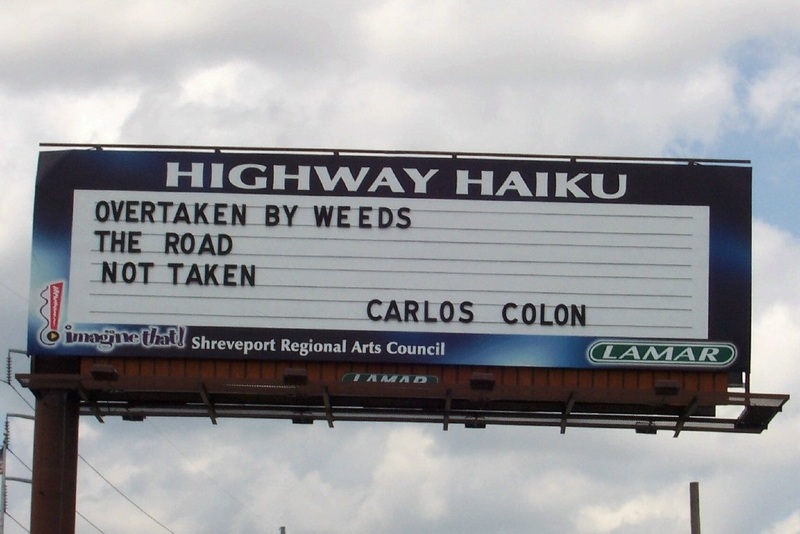 Between 2002 and 2006, the Shreveport Regional Arts Council and Lamar Advertising collaborated on a project called “Highway Haiku”. These two haiku above were among the 37 poems by 16 poets that were featured. “zen concert” has been reprinted 16 times including in the DVD Haiku: The Art of the Short Poem. “overtaken” has been reprinted 15 times including in Haiku in English: The First Hundred Years. This is my favourite poem, with “zen concert” being a close second. It is interesting that both of them were inspired by Alexis Rotella links from the same renga (“Mardi Gras Parade”). This poem speaks to my love of music and to the vinyl record collection I used to own. Now, being a lot lazier, I listen to most of my music through iTunes and Rhapsody. I am also intrigued that the layout of the poem coincidentally resembles the end of a tonearm. During my middle- and high-school years, I became a fan of Jesse Stuart, a regional writer from Kentucky. This poem was inspired by Stuart’s novel Hie to the Hunters, in which Did Hargis, a runaway city boy, is befriended by a rural family and experiences a different way of life. The corncob smoke comes from Arn Sparks, as she listens to the hounds hunting a fox. When I first began writing, I mostly wrote structured, rhymed poetry, and I still have a strong fondness for internal rhyme. This is the hokku for “Reading Thackeray”, a rhymga” (rhyming renga) I wrote with Marlene Mountain. This poem originally appeared in the local literary magazine of The Trapped Truth Society. When John Stevenson accepted the poem for From a Kind Neighbor: Haiku Society of America Members’ Anthology 1997, he made the marvellous suggestion of changing “my accent mark” to “my accent”. This poem first appeared in Mountain Climbing, a book of haiku and concrete poetry that I self-published in 1993 and dedicated to Marlene Mountain. 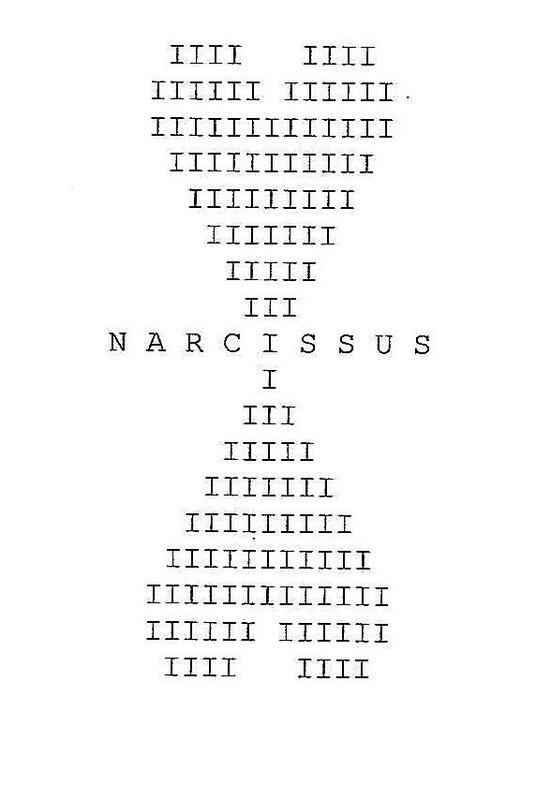 “Narcissus” was inspired by Marlene’s “peacock” from the second edition of The Haiku Anthology, edited by Cor van den Heuvel. For the previous 20 years, I had been experimenting with concrete poetry, especially with rhymed poetry. Seeing Marlene’s visual (“unaloud”) haiku was the catalyst for me to try to write some myself. When I sent a copy of Mountain Climbing to Marlene, she asked if I would like to write linked haiku together. This poem is part of “One Eight Hundred”, our first collaboration and is my first attempt at writing a concrete renga, although only about a third of the poem is concrete. The paulownia trees are flowering just now – they always catch my eye because the purple flowers seem such a long way up. We used to have one on a boundary with a neighbour but it’s not so much the flowers I remember from that tree but the sound of sparrows rattling the seed pods. Paulownia (empress tree, foxglove tree) is named for Anna (1795-1865), the daughter of Tsar Paul 1 of Russia (1754-1801). Courted by many, including it’s said Napoleon Bonaparte, she married the future King William II of The Netherlands, who stayed with the Russian royal family for the best part of a year before she agreed to the match. In The Netherlands, she was known as Anna Paulowna, which gives us the tree’s botanical name. Read more of this story here, as well as some botanical background. The faintly perfumed wood is traditionally used in Japan for clothes chests, particularly kimono, as it contains a natural insect and mould repellent, and is slow to burn (a big consideration when everyone lives in wood and paper houses). 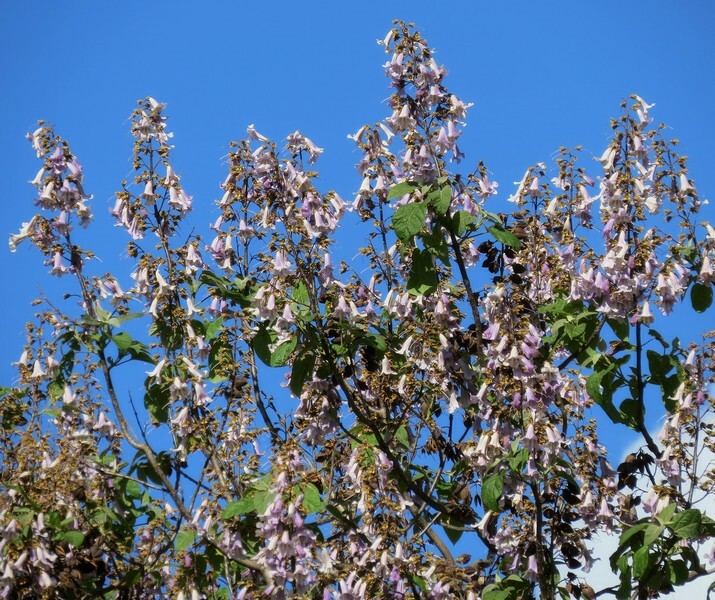 Read more about Japanese traditions associated with the paulownia here, including the planting of a paulownia when a daughter is born. Underlining its treasure box status is the fact that in The British Museum is a set of four calligraphy albums featuring haiku by Basho – one album for each season and each album stored in a paulownia box. I wasn’t able to find any haiku about paulownia blossoms – only the tree’s leaf fall in autumn which has significant, and ancient, connotations for Japanese and Chinese poets. The term ‘one leaf’ in a Japanese haiku is code for paulownia (kiri in Japanese).The fast-growing tree’s leaves drop throughout the year and symbolise loneliness and connote the past. The large, purple flowers are deeply associated with haiku because they hold 3 prongs of 5-7-5 buds, respectively. The blooms and their bracket of leaves form the crest of the Empress of Japan. Totsu is an exclamation uttered by a student of Zen Buddhism when enlightenment is achieved – it is also said to be the sound a paulownia leaf makes as it hits the ground upon falling. Sourced from the Old Pond Comics website. – Issa, from Haiku of Kobayashi Issa website. David Lanoue’s notes say: The phrase, “one leaf” (hito ha), specifically denotes a paulownia leaf in the shorthand of haiku. Shinji Ogawa notes that naku semi mo tsurete means “together with the singing cicada”. The falling leaf has a passenger!